Tonight I had a special opportunity to see the Jonas Brothers in concert in St. Louis and it was a real treat. Not only did I get to go to the concert itself but the more private sound check that they do about 2 hrs before the real show. 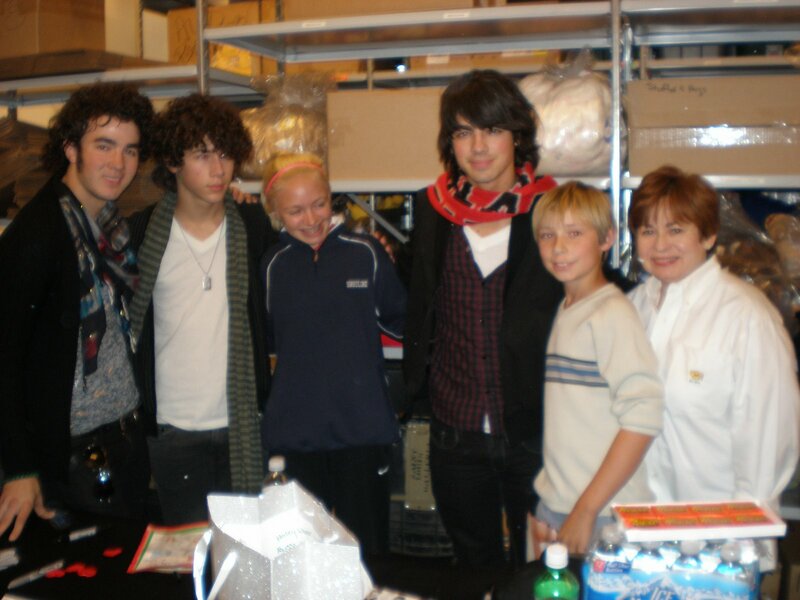 BABW has been a friend to the Jonas Brothers for years now. In fact, they were on our Macy’s float back in 2004 before anyone really knew who they were. They even tell us we helped make them famous. Then as a special gift to us, they came to our 10th birthday party in October 2007 at the Saint Louis Galleria where over 5000 young women showed up to celebrate with all of us. We can spot teddy bears a mile away and we knew these guys were special from the moment we met them and they have never let us down. But they don’t. They know how people helped them and they want to do at least that much for others. Another lead in group was a girl band from Korea, The Wonder Girls. They were also quite good and reminded me of a modern day Supremes. Lots of soul! I know for sure that it takes a village to raise a bear or a band and the Jonas Village is headed by their parents—Kevin and Denise Jonas and they have done a great job! Add to that their BEARY smart manager, Phil McIntire who has been very strategic and focused on the longer term, big picture. GREAT JOB! Talk about valuing your friends—coming in September to Build-a-Bear Workshop world wide will be an exclusive Jonas Brothers stuffed animal. It may be the softest, cuddliest animal I have ever hugged! You can dress it like the guys themselves and even add their own music. Stay tuned for details about our private launch party—first come, first served and all will get a PAWSOME gift from BABW and the JoBros. Thanks Kevin, Joe and Nick. You are a great example for us all. 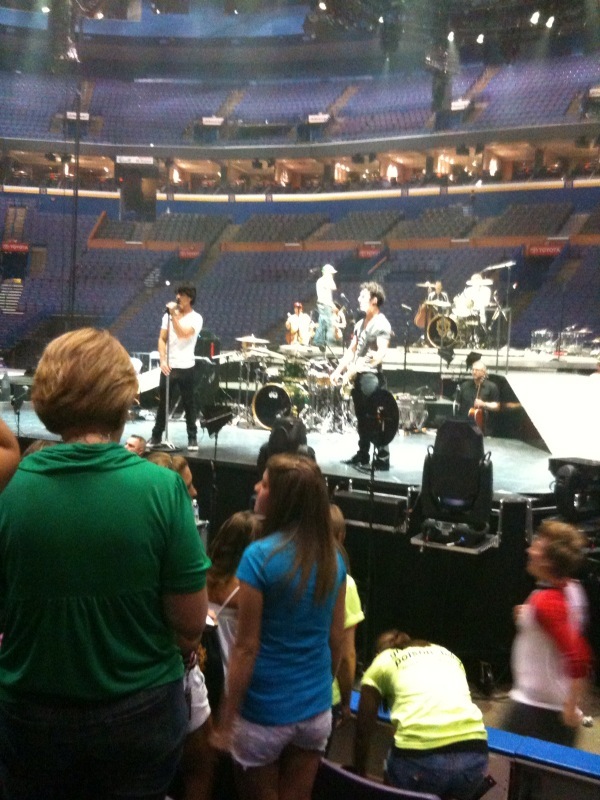 We love you in St. Louis for sure! In just a few days, some “pawsome” young leaders are coming to St. Louis to be cele-bear-ated and I can hardly wait. Those of you who read my blog know that to me heroes are teachers, astronauts, community leaders–people who put others first! What makes them heroes you might ask? They have selflessly accepted the challenge to do their part to make their communities, schools and our world a better place. These young leaders are heroes in my mind, and at Build-A-Bear Workshop, we call them our Huggable Heroes. We will have the privilege to honor and learn from 12 amazing individuals between the ages of 7-18 from the United States and Canada, as well as two of our beary own store associates, who have done a variety of things from helping animals and combating hunger, to supporting military troops, raising funds and awareness for medical conditions and disabilities, and helping children, countries and communities in need. What I find most amazing is that collectively, our 2009 Huggable Heroes have raised funds and gathered items valued at more than $16 million and have volunteered more than 6,000 hours of their time throughout the year. And to think they have done all of this on top of going to school, playing sports, being involved in extracurricular activities, spending time with family and friends and just being kids. While the Huggable Heroes are in St. Louis they will participate in leadership activities and work on a community service project to help a local St. Louis public school, Mason Elementary, get ready for the new school year. They will share their stories, network with one another and meet some truly incredible role models, one being Charles Best, Founder of Donorschoose.org. DonorsChoose.org is an amazing organization that grew out of a Bronx high school where teachers experienced first-hand the scarcity of learning materials in public schools. Charles, then a social studies teacher, sensed that many people would like to help public schools in need, but were frustrated by a lack of influence over what would be done with their donations. Thus, DonorsChoose.org was created so that individuals like you, me, anyone and everyone, can connect directly with classrooms in need and help make sure that students in every community have the resources necessary to learn. What I love about DonorsChoose.org is that they empower teachers and those they term, “citizen philanthropists,” to become change makers. All of our Huggable Heroes, past and present, are “citizen philanthropists” in their own right. The 2009 Huggable Heroes will not only learn a lot from Charles, but I think they will teach him a few things as well. To our 2009 class of Huggable Heroes, our 6th class — Bilaal, Brittany, Christine, Cody, Jenny, Katie, Kaylee Marie, Kendall, Max, Mimi, Patrick, Robbie — you are leaders in the truest sense. And, a special shout out to Coreen and Kim, this year’s store associate Huggable Heroes. You all are joining an amazing group of five classes of Huggable Heroes that have gone before you. They continue to grow their projects and impact others. I know this is just the beginning for all of you and I hope you see this time as a jumping off point to continue to cultivate your skills and grow your heart even more. I won’t be surprised to see many of you leading our country and our world into a very bright future. In May of 1961 President Kennedy declared that America would land on the moon by the end of the decade in order to insure that outer space was space for all. All great leaders have a vision and they declare it and thus it is so. Roosevelt wanted a cure for polio and Kennedy wanted to conquer space and Obama to mend our health care and education systems. It doesn’t happen in the words themselves or in weeks or even months. The greater the vision the longer the path and the larger the cost to get there successfully. This isn’t just true for medical science or rocket science—it is true in business and in the arts, in families and in local institutions. If it is worth having it will take time, dedication and human and capital resources to get there. Saturday night I was at the Kennedy Center in Washington, DC as part of the celebration of the 40 years. This event was a musical celebration to the historic NASA program and highlighted through incredible video footage and accompanying magnificent music performed by the National Symphony how far we have come. Astronauts Buzz Aldrin and Scott Altman narrated. Music from Star Wars, Lost in Space, Star Trek filled the room. Our song, “Let’s Talk About Love” written by Tena Clark, was selected to be part of the program too and was sung by the wonderfully talented, Jamia. Jamia even received a standing ovation! Little did I know in 1997 when we started Build-A-Bear Workshop that a song we inspired would be part of this historic moment. It seems that the stars are aligned and that outer space welcomes the children that aspire to know it better. To some, the space program was expensive and hard to measure. It was both of those for sure but it was more than what we can directly measure in so many ways. There were countless experiments that have guided modern day scientists that we will probably never specifically tie to the space missions. Maybe it’s most important legacy is that it ignited a generation to take science and math seriously. I know many a child, me included,that dreamt of being an astronaut at some point in their childhood. The reality of being an astronaut was for the most elite—the bravest and smartest pioneers. You truly had to have the RIGHT STUFF as they say! My childhood was full of examples of big dreams (and many costly ones) realized: the first organ transplant was performed, Disneyland and Disney World opened and astronauts walked on the moon. There was nothing to stop me from thinking about what could be because the unimaginable was becoming reality all the time. Thanks to that inspiration at such a young age I continue to live in a world of gigantic possibility. If someone can go to the moon than how hard is it to sell a few million bears a quarter or invent new places for people to buy stuffed animals? How hard is it to fix our urban public school systems? Our health care system? It’s not easy–don’t get me wrong but it is not rocket science. It is all about perspective. It is all about leadership. It is about executing the vision. Thank you to all of our brave astronauts for leading the charge and setting an example for generations of children! There are still many great bridges to cross and some will be solved through what we learn in space and others will be learned here on earth. We must continue to believe that we can and then WE WILL!! Happy Anniversary Apollo! I have often said that one of the best parts about being Chief Executive Bear is all the PAWSOME people I get to meet. Well, today was no exception! It is Major League Baseball All Star Game weekend in St. Louis and many famous celebs are in town to cele-bear-ate. It is great for St. Louis and especially exciting for our BABW store at Busch Stadium where we are selling our All Star Bears like crazy! Today I met one of my heroes, a celebrity in my book for sure–Nancy Brinker. Nancy, a former retailer who trained under Stanley Marcus at N-M in Dallas, is the Founder of the Susan G. Komen For a Cure named after her sister Susan Goodman Komen, who died of breast cancer in 1980 at age 36. Through Nancy’s hard work and determination, millions of women have survived breast cancer and someday a cure will be found because she BELIEVED! Nancy’s determination to create a world without breast cancer is as she says, personal. A breast cancer survivor herself, Nancy describes the success of her grass roots global organization as a personal enlistment of every segment in society to get involved, to educate and to change policy. What started out modestly has grown to be the largest grass roots organization in the world and catapulted Nancy into many public positions including being appointed the United States Ambassador to Hungary. WOW!! Nancy is a Midwestern girl from Peoria, IL and when you meet her, you feel like you have known her for years. She is genuine and down to earth but highly committed to her cause—now to save the world from breast cancer. What makes Nancy most down to earth is she does what she does out of passion and conviction and a belief that we can all make a difference. In my book she is every bit a hero and a celebrity. I am better for having met her today. Next week our 2009 Huggable heroes will come to St. Louis to be honored and like Nancy, they BELIEVE! Thanks to Nancy Brinker and all of our heroes who believe that making a difference for others is the greatest celebrity of all. Last week while in my hometown of Miami, FL I was able to enjoy the diversity that has become Miami. Miami always had a Latin feel but that was furthered during the 1960’s when so many Cubans fled to Miami for a life of freedom. Thanks to all of these immigrants—so anxious for a future, that Miami was reborn and is today one of the hub cities in our country—a hot place literally and figuratively to live, work and play. No longer is it a place for just good weather and Spring Break pandemonium but it is a place where diverse cultures have come together to create a 21st century city like no other in America. It has not been easy nor has it been with out strife but it does work. Not all immigrants to Miami are from Latin America. We met a man from Budapest at the Avis car rental who was so proud of just being granted his citizenship and the fact that his sons were in college and thriving. He spoke excellent English even though he was self conscious about it. His enthusiasm for what a good life he had in Miami and in America was understandable in any dialect. It was the sparkle in his eyes that really said it all. It is through his eyes and the eyes of all immigrants to our great country that we can see what we may take for granted—what freedom really means. How can we all understand how valuable it is if we have always had it? Aren’t we all immigrants of some sort? I immigrated from Florida to Missouri. I was an immigrant to the man’s world of business. Today I am a digital immigrant because I have had to learn technology where children today are born to it. I am an immigrant to all the things I have learned and still want to learn. I understand what it feels like to have to prove your sincerity, that freedom to achieve your true potential is not automatic—it still must be earned. On this 4th of July weekend I am reminded of all the values I hold dear, all of the freedoms I have been granted and all of the responsibilities that come with being a citizen of this great country. I live in a state of happiness fueled by a passion for everything I am committed to: my company. The people I work with, my husband and friends, my community, my young Guests I meet each week, my industry, my gratitude for my good health and every breath I breathe in freedom. I know that I have created this happiness by choice. I do know it’s not just one choice that makes the difference—it is all of the mini choices that I have made along the way that have led me to this moment in time. The choices that I am able to make because I am an American citizen. You are currently browsing the Maxine Clark's Blog blog archives for July, 2009.